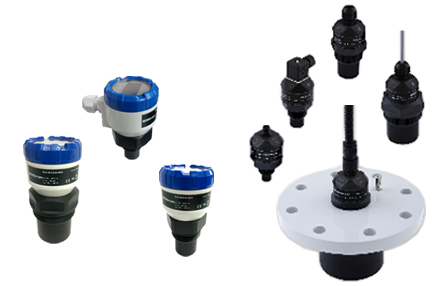 The SLU Ultrasonic level meters are compact measurement devices containing an ultasonic transmitter and an electronic module. The transducer generates ultrasonic pulses that travel at the speed of sound toward the target medium. These sound waves are reflected off the surface of the medium and are received by the transducer system. The “time of flight” between the transducer and the surface and then back to the transducer is measured. Based on the time period during which the individual pulses spread towards the level and back, this period is averaged by the electronics (that also performs temperature compensation) and subsequently are converted to an output current 4…20mA with HART protocol, Voltage 0…10 V or ouput RS-485 Modbus and the measured value is displayed on the display. The meters are applied for monitoring and control of liquid and solid levels without being in direct contact with the medium.